Silver bullets are hard to come by in the developing world. But this should not be discouraging. Take the international education sector. While its horizon doesn’t promise any night-to-day revolutions premised on a succinct call to action, it is dotted with evidence that reveals a diverse array of options for improving learning and, thereby, tackling extreme poverty. · Set simple, communicable standards—Standards are a vital mechanism of promoting accountability and high performance in education, and may matter more for poor communities than rich—rich communities are often able to “force” systems to provide them with a good standard of quality. Parents who are not aware of the level at which their child should be achieving may be satisfied with the education services a school is providing even as their child’s learning outcomes fall short. Education systems should set simple standards and, just as importantly, communicate these standards to parents so that they may better understand their child’s progress and hold schools accountable. Under the EdData project, for instance, USAID has facilitated the creation of reading benchmarks for the early grades in certain countries. (See for example the case of the Philippines). · Start curricula where children are—When it comes to establishing the right curriculum, sometimes too much ambition can be problematic. For instance, one official curriculum in a developing country sets a reading comprehension goal of second grade students being able to “construct the meaning of the text.” In this particular country, a large percentage of second graders cannot even read a single word. Such theoretically ambitious curricula sometimes reflect an upper middle class bias, and evidence suggests that they result in lower achievement. Curricula should instead set very specific standards that reflect where children are in their educational development, such as starting with the basics of reading. Some NGOs are able to do this without “dumbing down” the curriculum, by starting where children are, and then ramping up. Ministries should also be able to do so. Pratham, an organization dedicated to improving education for India’s poor, has carried out numerous interventions demonstrating that restructuring classes by learning level—instead of age—can produce large improvements in learning. Their successful “Read India” program is based on this principle. · Fix the mess in the early years—Uganda’s “triple crisis” in the early grades--high rates of grade repetition, lack of early childhood development programs, and low literacy rates—weighs heavily on the country’s prospects. But the crisis is not isolated there; some 40 countries are affected. 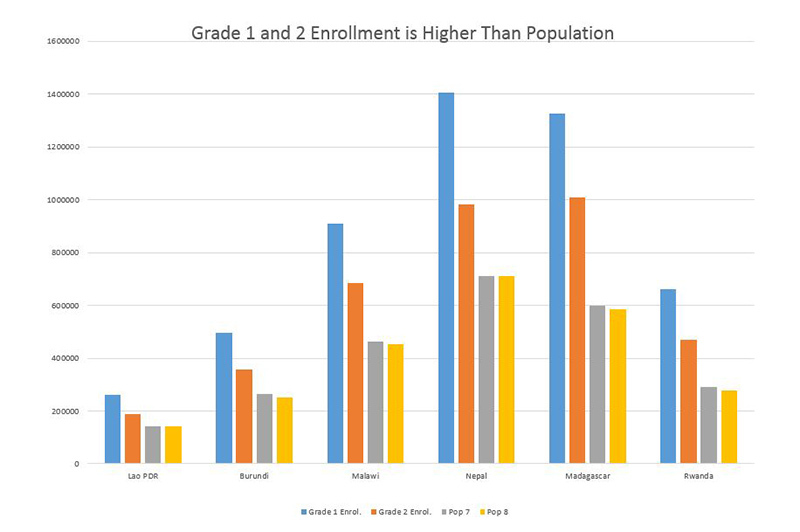 Some of the poorest developing countries report huge over-enrollment in the early grades and a big drop-off between first and second grades. This is not truly due to students dropping out, but to (often under-reported) grade repetition. As the chart below illustrates, many countries report grade enrollment rates that far exceed the population of grade-aged children in the country. A major part of the problem is lack of quality early childhood education and oral stimulation early on, which has contributed to, among other things, a crisis in early grade reading: about half of grade 2 children in Early Grade Reading Assessment programs cannot read any words. Fixing the problem promises far-reaching benefits—early cognitive development is the best predictor of later cognitive development, which is a good predictor of income. In Uganda, the government is working in conjunction with USAID on a National Action Plan for Child Well-Being that includes the goal of improving education in the early years. · Improve both accountability and pedagogy—A slew of research carried out on development programs in poor areas shines light on two batches of effective interventions: accountability (e.g. merit pay, community influence over teachers’ rewards) and pedagogy (e.g. better books, better teaching, tighter programming and supervision). Accountability interventions by themselves are unlikely to sufficiently change behaviors and outcomes. Pedagogical interventions are unlikely to be scaled or sustained without accountability and supervision. Therefore, it is important that accountability and pedagogical improvements are both pursued. The two approaches are highly complementary from a strategic management perspective as well. As I explored in a recent co-authored paper, education systems in developing countries are typically in need of very large improvements in learning outcomes. Results of such significance are typically only achieved through direct pedagogical interventions, which are extremely expensive to take to scale. However, system-level changes—such as improved accountability—have the potential to improve teaching and learning on a national scale. For example, projects in Kenya are utilizing school monitoring systems to better track observations of instructional practice. · Work on mother tongue—Providing instruction in little-used home languages is often considered too complicated: doing so requires more advanced logistics, coordination, creativity, teacher placement and support. But perhaps the biggest disadvantage of the poor is linguistic and related to early grade reading, and it has been demonstrated that vast improvements in reading outcomes can be achieved through instruction in mother tongue. As poignantly described by SIL, local languages have a critical role to play in achieving the biggest development goals on the horizon. · Pay attention to finance and resources—Finance matters but the “how” may be more important than the “how much.” Increases in salary levels, for instance, generally do not lead to learning improvements. A World Bank assessment of government-funded schools in Malawi found almost no relationship between expenditure and results. Pro-poor financing that is tightly linked to results can help, but care must be taken to avoid perverse incentives such as teaching to the test. Differentiated support (e.g., more funding for the poor, or more investment in teacher support where results are lacking rather than in blanket professional development) would be a real innovation in many countries. · Rethink systems—Increasingly, vertical interventions such as USAID’s Early Grade Reading programs have delivered impressive results. However, full systemization of education in the development context has proven elusive. Previous efforts to improve systems (in the 1980s and 1990s) were somewhat de-linked from learning outcomes, results measurement, and concrete use cases that could exemplify what the reforms can achieve. Now programs such as Early Grade Reading offer concrete proof of application and impact. Practitioners should look deeply at the concrete recent experiences and consider whether there is an applicable “bare-bones” or “sine qua non” systematic approach for meeting needs of the poor. The DFID-funded Research on Improving Systems of Education (RISE) program is a promising innovation. Ideally, these interventions should be considered all at once, as part of systemic reforms. But there are versions or subsets of these systemic interventions that could yield benefits relatively quickly and would not be hard to take to scale, if political will exists.